Team Suzuki Press Office – July 24. 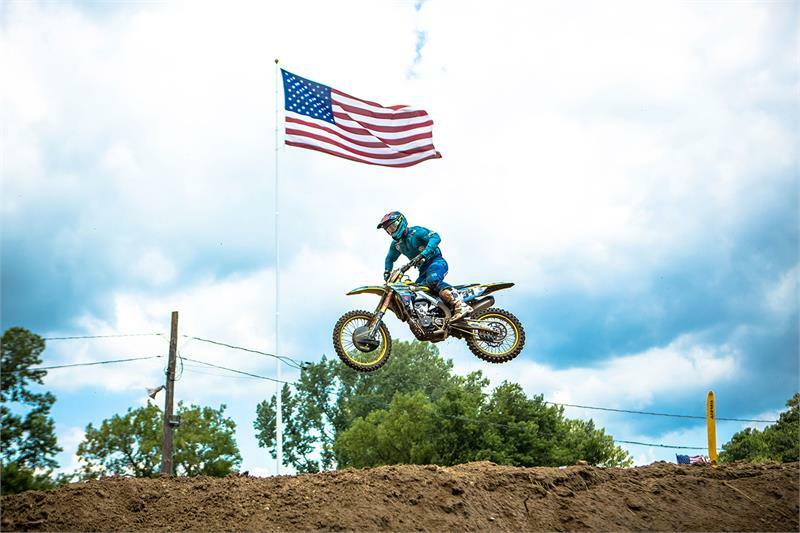 The Autotrader/ Yoshimura/ Suzuki Factory Racing Team rolled into Spring Creek, Millville, Minnesota for round eight of the 2018 Lucas Oil Pro Motocross Championship. Riding the all-new Suzuki RM-Z450, Weston Peick dazzled the massive crowd by logging ultra-consistent moto scores in finishing sixth place. Teammate Justin Hill overcame near heartbreak in the first moto by slicing through the pack to land another top ten finish in his 450 National rookie campaign. Justin Bogle nailed a staggering fourth holeshot in six motos, and secured his best results of the season. In the 250 ranks, Brazilian rookie sensation Enzo Lopes made his return after a several race lay-off as a result of a cracked collarbone, and logged valuable seat time on a track he has never ridden before. He was joined by Suzuki RM-Z250 teammate Jimmy Decotis, who rode with fervor but was waylaid by a bout of bad luck. Two torn tendons won’t stop Weston Peick from putting his Suzuki RM-Z450 near the front of the pack. In both motos the Southern California native was inside the top five when the field rounded the tricky right-hand first turn. He held strong, managing to navigate the whoop-laden hills of Millville with an injured hand. Peick’s 6-6 moto scores earned him sixth place overall. He is also sixth overall in the points standings. Justin Hill is receiving an education in 450 racing this summer, and he’s passing with flying colors. The Autotrader/ Yoshimura/ Suzuki Factory Racing Team decided to give Hill seat time on the Suzuki RM-Z450 in preparation for the 2019 season. The Yoncalla, Oregon native has done well, and he continued that success in Minnesota. Hill charged through the pack in the opening moto after getting tangled up in the first turn, moving from 26th to 10th by moto’s end. A better start in the final moto, coupled with lightning-fast lap times late in the day, resulted in seventh position. With 10-7 moto scores for eighth overall, Hill moved up to ninth place in the overall points standings. Benjamin Franklin once wrote that there are two certainties in life; death and taxes. Judging by Justin Bogle and the all-new Suzuki RM-Z450, another certainty may need to be added to the list; Bogle getting holeshots every weekend. The Cushing, Oklahoma native has tripped the chalk line first in four out of the past eight moto starts. Leading the field proved advantageous at Millville, as Bogle logged his best outdoor results of the season. The 14-12 moto scores placed him 12th overall on the day. He is 29th in the overall standings. Rookie Enzo Lopes has endured a rollercoaster ride this summer. A valuable addition to the Autotrader/ Yoshimura/ Suzuki Factory Racing Team prior to the start of the Pro Motocross Championship, Lopes showed outstanding speed and endurance. Unfortunately, a tumble at High Point left the Brazilian with a cracked collarbone. He returned to action at Millville after a three-round layoff, despite having only a few rides on the Suzuki RM-Z250. He showed grit and determination by racing through the pain to score 17-19 moto finishes for 19th overall. Lopes is also 19th in points. Jimmy Decotis is making progress since returning from a serious back injury. Known as “The Rippa” by his legion of fans, Decotis put in great effort on Saturday, but the deep and rutted conditions held him back from having a record day. Decotis’ 16-24 moto scores were good enough for 20th overall. He is also 20th in the points standings. The Autotrader/ Yoshimura/ Suzuki Factory Racing Team will head to the picturesque northwest in Washougal, Washington for round nine of the 2018 Lucas Oil Pro Motocross Championship on Saturday, July 28th. BMW Motorrad Enduro Park Hechlingen celebrates its 25th anniversary.